Sometimes life is kind enough to bring a friend into your life at just the right time, in just the right place, and you have it and hold it dear to you for all the rest of your days. For me, that’s my friend Emily. Em came into my life my first year of graduate school when I had just moved to Minnesota knowing only one person in the entire state, as I was about to start a seven year program as a cohort of one. The first year of my Ph.D. program was a humbling experience altogether, but those first weeks were brutal. I sat in my classes stunned into silence by my peers and by students three and four years in with so much more knowledge and poise than I thought would ever be possible for me to attain. The community in my department was welcoming, certainly, but not having anyone with whom to share the vulnerabilities and doubts of the first few weeks was scary and isolating. Emily was part of a cohort of first years in a neighboring department where we met in a class on gender, race, and class in American culture. They were all so nice and warm and I was lucky that they brought me into their fold as an honorary member as quickly and effortlessly as they did. I hate to think what the rest of that year would have looked like for me had they not taken me in. I got even luckier, though, when Emily and I discovered that we lived literally right on the other side of the block from one another – oh, kismet! Our friendship was sealed and we’ve shared many a memory and milestone together since. Though Em has long since moved back to San Francisco, I still miss her like she left yesterday. Which is why when I recently found myself with a brand-new mandolin slicer, my first thought of making a grilled zucchini lasagna was eclipsed by the idea of making some dried orange slices for tea and sending them her way. Emily is a tea connoisseur, you see. Prior to meeting her, I always just happily drank whatever bags I had gotten on sale last time I went to the grocery. I knew nothing beyond those sad, little pouches. Loose tea? Different brew times? Herbal vs. black? No clue. What I learned through my friendship with Emily, though, and the inspiration I found as I tasted and learned about different teas through her and for myself, was that great teas are uncomplicated, sometimes not very fancy at all, and are best when left alone or, only slightly adulterated, by the tiniest squeeze of lemon or drop of cream. 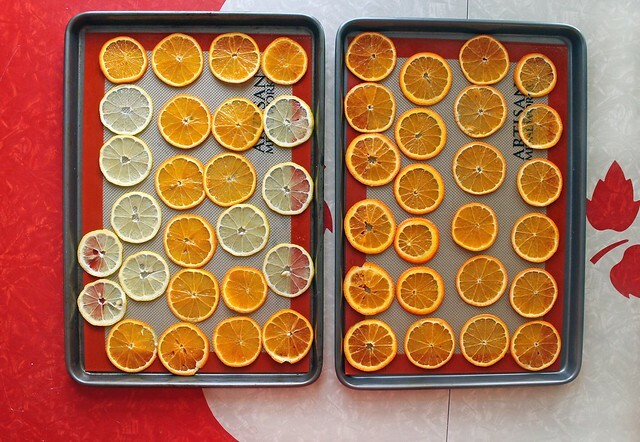 These very thinly sliced, dehydrated oranges and lemons – one snuck in to my slicing and drying! – are a wonderful addition to any old cup of tea. They add a subtle sweet taste of citrus to your brew and the aroma of them steeping in the hot water makes every sip feel really special. Kept in a sealed container – I’m partial to a small jelly jar, but even a sealable plastic bag will do – they last forever. While they’re obviously great in hot tea, I’ve also enjoyed them in iced tea, cold water, and Em herself gave me the great idea to try one in a pint of wheat beer. So refreshing! These are a year-round staple, a great gift, and a sweet new way to enjoy a bunch of different beverages. I’m imagining them in a bevy of different summer cocktails as well! Or, if you’re Bear, you can also dip them halfway in melted dark chocolate, let them set up on some waxed paper in the fridge, and then talk about how you’re a master chocolatier and have never tasted anything better in your life. Whatever your pick. You do you. Preheat oven to 200°F. Line a baking sheet with a silicon baking mat or parchment paper and set aside. Using a mandolin or a very sharp knife, carefully slice the orange – my mandolin was set on its thinnest setting, which is 1/16th of an inch. Arrange orange slices on the baking sheet in a single layer and sprinkle with sugar if desired – I skipped the sugar because my oranges were very, very sweet. Bake for 2 to 2-1/2 hours or until the slices are completely dry and the flesh is translucent. Remove carefully to a baking rack and allow to cool completely before storing. 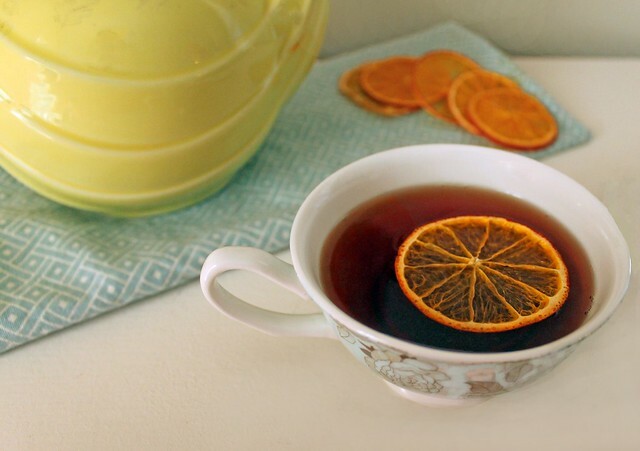 Can I use dried oranges in sun tea? We live in Texas so we take advantage of the sun! We make sun tea old school style and put the glass jar out all day. 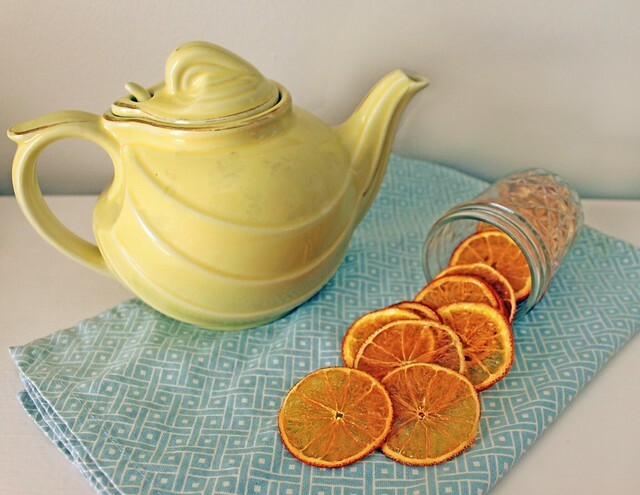 We’re dehydrating oranges and wonder if we can put them in the sun tea? Hi, Tia! I bet these would be *delicious* in sun tea! I would suggest putting them in and after the sun tea has steeped so that they don’t overpower everything if set out in the sun all day in the liquid. Let me know how it goes!